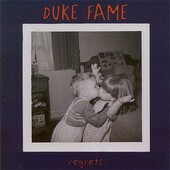 Duke Fame is your classic small city rock band. Four friends that get together to drink beer, escape their day jobs, and jam away, creating music for the sheer joy of it. They have no expectations of becoming stars. They just want to play music at their local club, friends' parties, and a few outdoor events and connect with those that buy their CDs or attend their live shows. A simple, "I like what you guys do" from someone out in the crowd makes their day. And though they're not groundbreaking in any way, shape, or form, their brand of rock, as found on Regrets, is bare bones and simplistic enough to rock. It is the epitome of what rock is about: sloppy and flawed. And though you'll probably only listen to the disc once and forget them, the minutes you spend listening to them just might remind you why rock is such a vital release. I'll give this a C-.